If you want to take your bike on a bus in Norfolk and the fens, it seems you can if it folds and you put it in a carry bag/box, except for the few services which are standing-room-only. In practice, you'll probably be allowed a cleanish folded unbagged bike, as long as the bus isn't too full and you're not an idiot about it, but I'd take a bag if you've got one, just in case. You are very unlikely to be allowed to take a full-size bike on and even a bagged or boxed full-size bike will be at the mercy of the driver because it's oversize luggage. Lynx operate the Marham, Three Holes and some Hunstanton coastal routes. Lynx Frequently Asked Questions says "Unfortunately normal bikes are not allowed on board a lynx bus. However if you have a bike that fully folds up you're welcome to bring this on board and stow it in the luggage pen." First operate the X1 Peterborough-Lynn-Norwich-Yarmouth route. First Eastern Counties conditions of travel section 7.8: "Folding bicycles are permitted on board our buses, provided that they are stowed safely and that they do not block the aisles or access to seats." 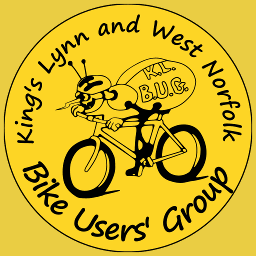 Coach Services (services to the Brandon/Thetford area) tweeted: "Folded bikes will be accepted in a suitable carrying bag that can be safely stowed." We have no information on the occasional services from Sanders, Peelings, Eagles and WNCT. For travel further afield, try atob magazine's information on coach services. Why is it so difficult to take bikes on English buses? Our colleagues at Bath Cycle Campaign tried to help bring American-style bike racks to England, but ran into a brick wall of a government agency.